8:30pm(ish - drag queen time) on a Thursday night, and four of London’s finest queens have gathered a crowd into the backroom at Folklore for a tribute show to the one and only Dusty Springfield, accompanied by the beautiful songbird Veda Black. It’s a beautiful venue for such a show - Dusty’s face projected onto the back wall surrounded by masses of flora and fauna (mostly of the fake kind, I believe, but realistic enough that it doesn’t matter) - and the accompanying soundtrack playing as we settled in for the show only served to remind me just how much I love Dusty’s music. The show opened with Sister lipsyncing along to ‘The Windmills Of Your Mind’, Dusty’s music video projected onto the screen behind her. For a queen who is usually all about the laughs, there was something hauntingly beautiful about this opening number. I might just have been dazzled by the light reflecting off of the rhinestones on Sister’s dress. The world will never know. The first act of the show concluded with the incredible Veda Black singing three Dusty numbers. If you’ve not heard Veda, I urge you to go look her up on any of the major streaming platforms (Spotify, Apple Music etc) and give her a listen. Her voice is gorgeous. She treated us to ‘I Just Don’t Know What To Do With Myself’, ‘You Don’t Have To Say You Love Me’, and ‘The Look Of Love’. It was the perfect way to kick off the tribute show, and got some of the classics in there straight away. Veda also brought a cheap Amazon ‘Dusty’ wig on stage with her, in a sort of macabre scalping sort of way, and stuck it on the mic stand. I don’t know why I found it so amusing, but I did. It didn’t help that for half of Veda’s performance her entire face was obscured by said wig, making it look a little like her hair was wearing the Amazon wig. It’s the little things. Cynthia Seaward, London’s favourite noodle lady, took to the stage after a short break for a rendition of ‘Mama Said’, interspersed with sections from ‘Mommie Dearest’. Comedic joy at it’s finest, and a delight for any Joan Crawford obsessed gay in the audience. She also gave us her interpretation of ‘Son of a Preacher Man’, but with little peaches with faces on. I’m not entirely sure who the peaches were supposed to represent (the son? The preacher man? ), but I digress. Son of a P(each)er Man? It truly doesn’t get more dad joke than that, really. But I loved it. It’s such an iconic song anyway, that the visual of Cynthia smashing two peaches together ‘kissing’ was only going to add to that. At times throughout the night, under the guise of learning something (thanks Sister), there were small excerpts of people who knew Dusty talking about what it was like to be her friend. Insane in the weirdest and best kind of way is the only way to describe it, and I thought I was a tricky friend to be around. The first was dedicated to Dusty’s cat who died, and then she wanted to freeze. Freeze for what exactly? Well, we never found that out. And I’m quite glad we didn’t. The second excerpt was about how Dusty was so paranoid the cats would eat chicken bones, for the entire time a friend stayed with her they chucked any rubbish into the pool. Including a pair of mannequin legs. The third was dedicated to Dusty’s teddy bear, Einstein, who apparently went everywhere with her. The video clips were rounded out with a story about how Dusty insulted the royal family and was sent, by Princess Margaret, a stamped and addressed apology letter for her to sign and send back to the queen. Quite astonishingly mad in every sense of the word. But now you too have learnt something. Glew-as-Lauren-Harries also gave us two, excellent, camp numbers. The first was ‘Baby Blue’, which if you have heard it you will know that it contains quite a long instrumental part. If you haven’t heard it, I’ve put together a Spotify soundtrack of the night so you can pretend you were there too, out having fun and not at home crying to Call The Midwife. Glew, never one to shy away from doing something stupid, shimmied her shoulders, body, and perm for the entirety of the number. On stage, off stage, up and down the aisle, the camp queen shimmied her way wherever she could. Good word, shimmy. Give her her due, she never once let the energy drop and kept that shimmying going for the whole instrumental. Impressive, in anyone’s book. Her second number was ‘In Private’, in which she really played up Dusty’s lesbian tendencies (because as we all know, Glew the Queen Underscore is also a lezza). Lovely. Joy Less, who is ridiculously camp in any situation, was clad in a long pink nightgown-esque dress and huge beehive. According to Flynn, this beehive had come flatpacked when Glew bought it and (understandably) chose not to wear it. It was definitely a bold choice. It was not a choice that stayed on the head very well. It looked a lot like Dusty’s dead cat. However, it worked perfectly with Joy’s first number ‘All Cried Out’, when she whipped the beehive off of her head and pulled out stacks and stacks of tissues from deep inside the monstrosity. Stupid and brilliant. 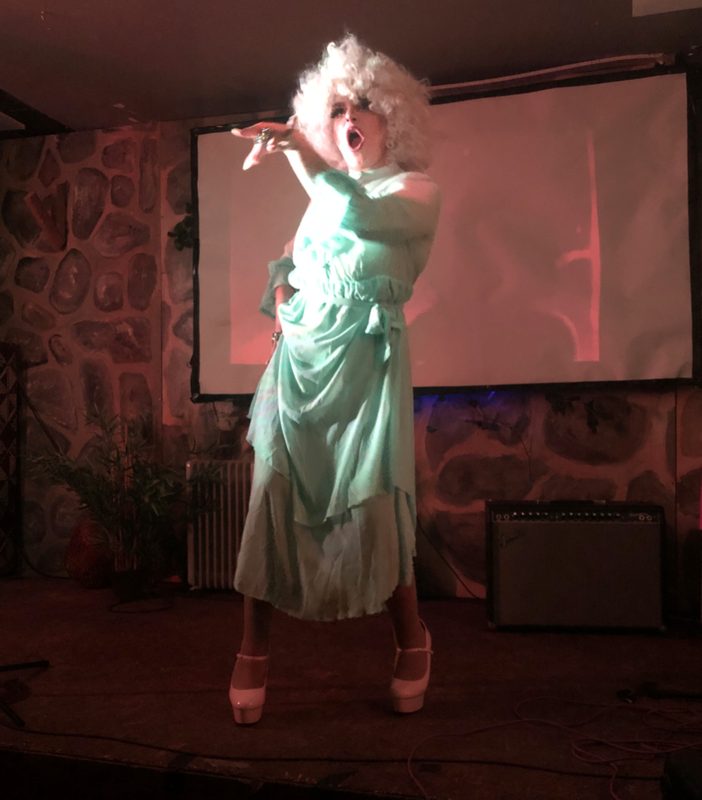 Her final number was ‘Wishin’ And Hopin’ with everyone’s favourite part of the evening, the bit where the drag queen forces you to participate with some literal dance moves. And literal dance moves we did. I had more fun than I probably should have done. Halfway through the show we got Sister doing ‘Twenty-Four Hours in Tulsa’ - including a stupid bit with a bell that you get at the counter of a fast food restaurant, and other such delights like roosters crowing. Because of the 24 hours bit. You get where she was going? Sister finished out the show with another Dusty classic - ‘Quiet Please, There’s A Lady On Stage’. Ironic? Possibly. Wonderful? Definitely. She once again had the live version playing on screen behind her, and there was quite a beautiful moment where Sister and Dusty were almost back to back. Loved it. All in all (and I say this with utmost sincerity, despite having been told to say only nice things) I had a brilliant and camp evening, and you truly can’t ask for much more than that from a drag show. A Surprisingly… event returns to Folklore in Hoxton on the 25th April (2 days after my birthday but that’s by the by) with a celebrity impersonation edition. If it’s anything like the last shows have been, you have to go. Keep an eye out on Sister, Joy Less, or Glew’s instagram for more details closer to the time. (And follow Cynthia and Veda while you’re there). If you enjoy my work & want to support this blog, please consider buying me a coffee at the link below!